The 21st century has brightened up with the evolution of smartphones and their extra smart applications. Where people are busy in experiencing and enjoying virtual reality by using various technological advancements, some are taking interest in some ‘actually valuable’ learning applications. Today, you can enhance your skills and solve many critical problems through smart applications. For Android users here is a list of applications, which can assist you in learning new things and developing many skills. You can even enhance your expertise too. These applications are either free of cost or are highly reasonable. Keep reading and feed yourself with the gems of Play Store. Amazon Kindle is one of the most comprehensive e-learning application. It enables users to read, learn and practice different skills from various authentic books. Being a traditional app it comes with a huge collection of self-help books, how-to-books, textbooks and many informative books. One can buy and download them to read at any time of the day. These books are comparatively less expensive than those with huge physical outlook. The device has a lot of free space and provides a great room to store as many books as possible. Moreover, the Play Store gives the users an opportunity to choose between similar apps like the Google Play Book and Nook. Coursera provides a pleasant blend of old school and modern manner of e-learning, while providing a great way to acquire education. Through advanced e-learning facility, it helps students—belonging to any part of the world—get education and learn whichever subject they want. It offers more than thousand topics of subjects, ranging from mathematics to science, arts to music. Over the completion of the course, the user can even receive a certification. The prices vary with each course; however, some of them are free. It is a secure manner of learning and developing skills. It worth a try! As the name intends, Duolingo is a language learning application. In quite an innovative manner, it teaches users many languages. However, using mini-games, it teaches the language in a bite-sized chunk. The app is totally free of cost and comprehensive in terms of learning. It provides a basic ground for learners to practice a language and to achieve a command over it. After completing the course, you can move on to some other advanced level training apps like Memrise and Rosetta stone. Khan Academy is one of the biggest Android Apps for learning and teaching. It has a huge range of principles and subjects. The courses have over ten thousand assignments, topics, notes, lectures and video content. The academy provides slide shows, presentation, and exam papers to help students learn more properly and polish their concepts. One can use it to learn multiple subjects. You can brush up previously stored files and make the app clean and ready to use for the next course. Its reasonable budget makes it one of the most famous apps. Lynda is founded by Lynda Weinman. It is an online learning resource, which is quite similar to Udacity, Udemy, and Coursera. The app is dedicated to technology-related topics and polishes work-related skills. The content present on the app teaches users how-to-code, how-to-design, how-to-create-a-website, and stuff related to music production and the tools of Microsoft. The tool is highly useful and innovative. However, it is quite expensive, but it is highly effective. There are some free courses as well. With the expert assistance of PhotoMath, you can be free from math phobias. Now you don't have to hide under your books to solve a complicated problem, simply click a picture and get the solution popped up on your screen. PhotoMath tells directly what purpose the app serves by its name. When a user clicks a picture of any unsolved question the app though OCR technology detects the answer and in a step-by-step process comes to the final solution. In this way, it not only acts as a problem-solver but also teaches students too. With the free version, you can easily solve a huge number of basic equations and problems when you go for paid versions you can expect to be a pro with comprehensive and detailed solutions with explanations. Udacity gives an opportunity to users for learning advanced level skills. It prepares individuals to excel in job-seeking skills and in highly paid areas. It is somehow similar with Lynda but the only difference is that it focuses on particular courses like Computer programming, artificial intelligence, app development, machine learning and many others. Over the completion of the course, users are awarded Nano-degree, which are authentic and trustable. There are some free courses available; however, the advanced ones require paying. Google also collaborates with the app for many courses. YouTube is the hub of information, crazy strollers, entertaining YouTubers and experienced personals. From YouTube, you can acquire whichever type of information you want. From basic of schooling to professional reports over advance studies and mechanics, funny memes to stuff related to technological advancements, in interactive and reliable videos it provides users with tons of information and material. You can learn almost anything from hairstyling to make tips, engineering to therapies; it has a huge database of valuable material. The best part of YouTube is that though having a plethora of information it does not create bugs or issues in displaying information. Udemy is the best course-style learning app. It focuses on developing skills of individuals. It provides courses ranging from Adobe apps to Microsoft programs, mathematics to schooling subjects. 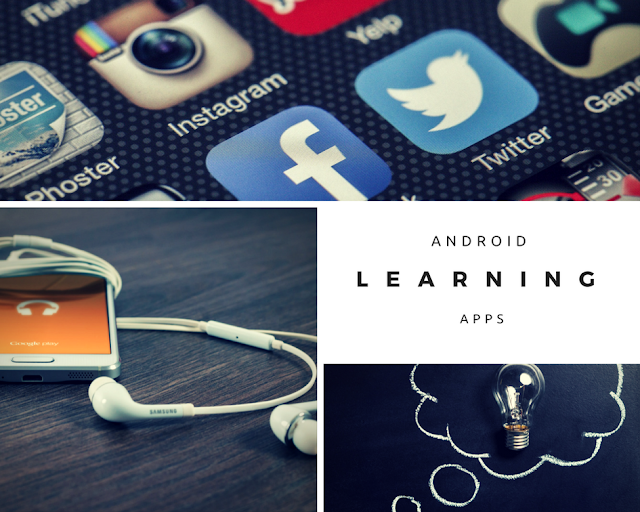 These are the top learning applications for Android users. They can help you build a prosperous future by providing you the gems of knowledge. Carrie Burson is a talented writer who has a sound knowledge about apps and technology-related subjects. Being a skilled writer at a mobile app development company, Cecelia acquires a deep understanding of complicated functions and process involved, which help her deliver rich and valuable content.